The battles that spies fight are often chosen by the enemy. Almost entirely across the board, their goal is to covertly gain access. Spies may spend their entire professional lives in situations where discovery means death because that is where the targets are. Computer networks. Assassination targets. Classified locations. Even secrets that only exist inside someone’s actual brain. Were it easy to get to these things, spies would be unnecessary. 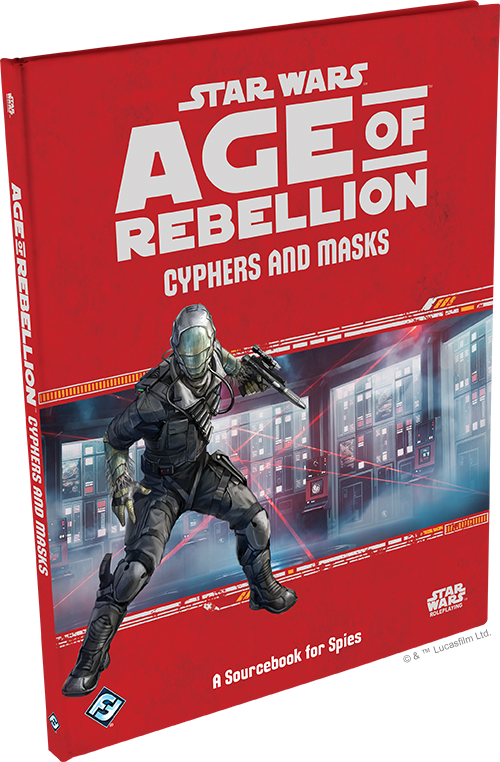 Cyphers and Masks, an upcoming sourcebook for Star Wars™: Age of Rebellion, expands the scope of responsibility and capability of the Spy career for both players and gamemasters. Strikingly strange in appearance, the Melitto are a surprising oddity. While their bodies are shaped in an appropriately bipedal humanoid form, the front of their head, where one would expect to find a face, is covered with solid, opaque plates of chitin. Instead of eyes, Melitto study their surroundings through scent, vibrations, and electrosensitivity. 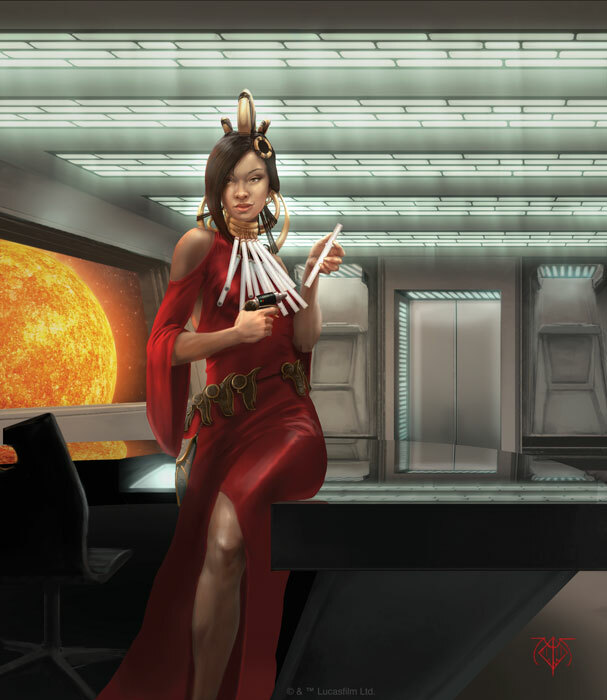 The homeworld of the Melitto, Li-Toran, is remarkably inhospitable to most species in the galaxy. Constant volcanic activity, violent storms, and dark clouds of toxic gasses make the world too hazardous for most industry, trade, or exploration. As such, the Melitto culture has had very little interference from outsiders. Their social system is itself highly insectile. Hives are controlled each by a queen and her younger female servants who in turn control the numerous male workers who gather food, build the physical hive structure, and even battle other hives. When a hive population grows too large or food becomes scarce, female servants—called myrmitrices—travel to a new location to begin a new hive with their male myrmites. Individual myrmitrices control their own stable of myrmites, and after struggling with one another for the chance to be queen of the new hive, myrmites whose myrmitrix has been defeated and slain are not assimilated into this hive. Instead, they become hiveless ronin. Most ronin leave Li-Toran to find their home among the stars to become expert hunters and thieves. Some are rumored to have founded their own ‘hive,’ a community of ronin in the underground caves of their planet which answers to no queen. Many would think that the inability to see would put Melittos at the mercy of their surroundings, but in fact the opposite is true. Melitto characters begin with a free rank of the Perception skill, and they never take penalties to Perception or combat checks due to darkness or vision-related environmental factors. As most Melittos encountered in the galaxy are of the male ronin variety, they have an innately higher than average Brawn rating which is a natural extension of their being bred for manual labor and combat duties. While some spies dedicate their entire careers to never being seen, the Interrogator specialization centers around personal contact. Interrogators directly interact with their targets to extract the information they require. These methods are sometimes brutal, and sometimes so gentle the target isn’t even aware. Their expertise in social conflicts is not merely used offensively, though, and Interrogators are also able to train their allies to protect themselves from probing questions and even resist varying degrees of torture. While some social specialist characters prefer to use Negotiation or Charm to come to a mutually beneficial agreement, the Interrogator is most often going to utilize the Coercion and Deception skills because their strategy is one of control. They are like a verbal and psychological pugilist, using the Know Their Weakness talent to downgrade the difficulty of social checks against their target, softening them up for assault. And while the Nobody’s Fool talent provides great protection for themselves in these social conflicts, Interrogators truly shine when their opponent is already against the ropes. Three talents in the final tier of the Interrogator’s talent tree combine with incredible efficacy. First, we’ll begin with Pressure Point, which on its own may seem somewhat out of place. Pressure Point allows the character to substitute strain for normal wound damage when making Brawl checks. This is followed by Exhaustive Questioning. When a captured enemy is targeted by a social check, the Interrogator may lower the target’s strain threshold and also inflict strain by spending . These two strain-centric talents are capped with the finishing move of Made You Talk. 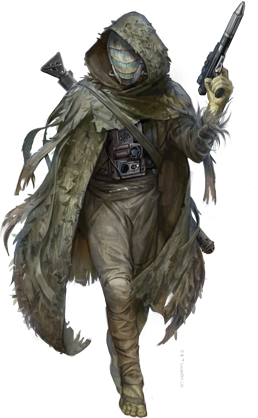 By making an opposed social check, the Interrogator and their group gain a significant bonus based on the type of enemy that was made to talk. The roll to achieve this feat is any social skill check, meaning that the Interrogator may determine that using Deception to trick the target into accidentally revealing their secrets will be more effective than using Charm to get on their good side. Where the other two talents come into play is that for every 2 strain that has been inflicted so far in the encounter, the Interrogator gains cumulative boost dice to their check. This talent can produce some remarkably tense roleplaying scenes, but the nature of clandestine warfare is rarely pleasant. Uncover and transmit the Empire’s most sensitive information when Cyphers and Masks (SWA53) releases at your local retailer in Q4 2017!